Data slice is the concept which we've been using for years. A data slice collects user data and calculates metrics separately for designated applications or streams. Along with white label custom branding capabilities this allows showing streaming metrics to any number of end users for billing purposes or for improving streaming user experience. Major metrics set of each data slices are daily-granulated stats which include connections, traffic, bandwidth, time and duration, geo-location, devices and players stats. The majority of this data may be exported via our API. Commonly these daily stats are split by days using UTC, or GMT+0, time zone. So if any streaming company from U.S., Canada, Brazil or any other American country would make some evening event, it would be split by 2 days which is very inconvenient from user point of view. Our customers have been asking us to improve data slices and include time zone setting to split data by days more accurately. So now this option is available. Let's assume we have http://origin.ultimatemediastreaming.com/live/stream/playlist.m3u8 stream and we want a data slice for it calculating stats using GMT-06:00 which is a Central time zone in U.S. Select Control / Data slices menu or click on Manage link in Data slices sub-menu. You will see data slices management page. Click on Create streamed data slice to see the following dialog. Enter slice name and optional description. Then select time zone from the drop down list. 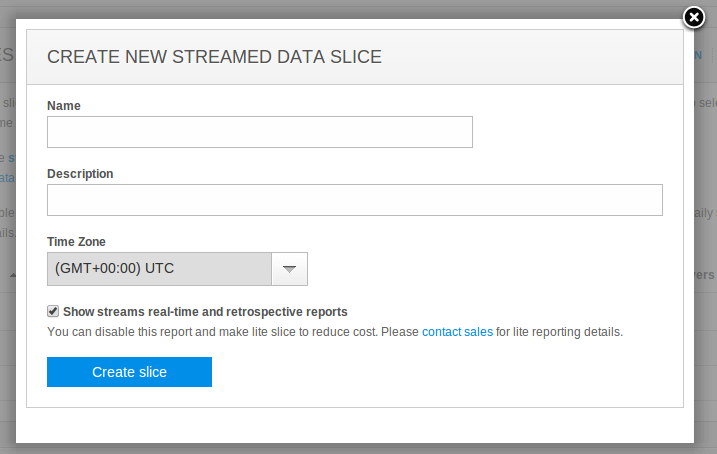 You may also uncheck "Show streams real-time and retrospective reports" checkbox to have your new slice be a lite slice. 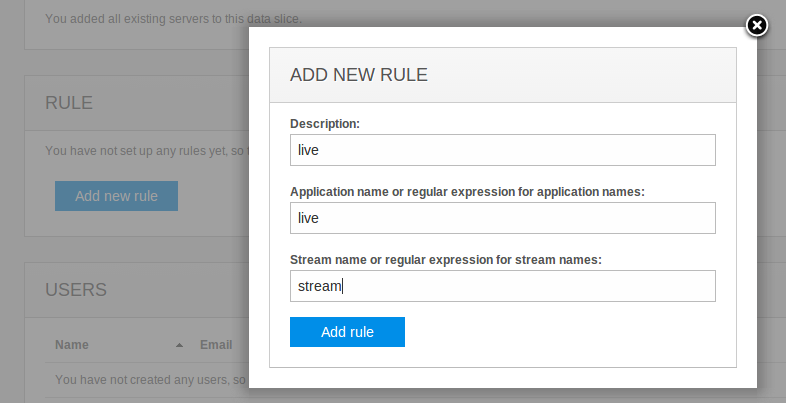 You will then be redirected to a new slice details where you can define rule for data collection as shown below. This rule covers app name and stream name. Entering data slice stream details. Now when you create a slice, the data will start to be collected from the moment of creation. It will be collected in designated tie zone. You may convert existing slice' time by going to slice detail from slices management page and clicking on Edit link. In this case current day data may be affected by mixed numbers so we recommend making conversion on some non-peak days.